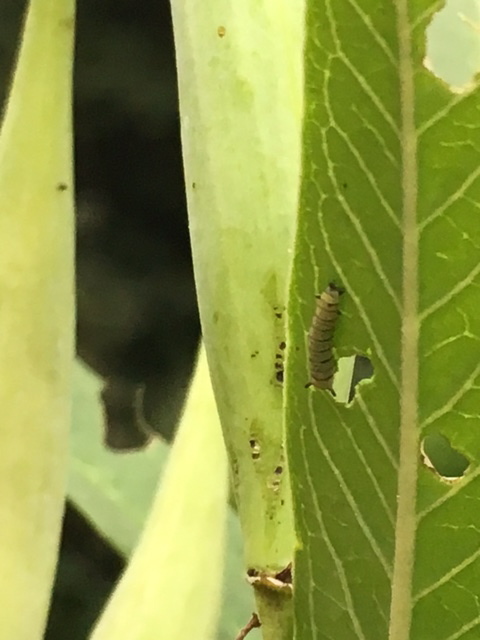 This is the second year for the butterfly garden and the Monarch Butterflies arrived, right on schedule, in August, to lay their eggs on the undersides of the Asclepias leaves. I actually witnessed this! The eggs hatched into lots and lots of these striped and ravenous caterpillars. At one point there were at least 30 of them on one plant! That left me worrying about the food supply so I carefully moved many of them to other Milkweed plants. They didn't miss a beat and kept eating until they were ready to crawl off to form their chrysalises, leaving the plants, well... The Asclepias Stripped Bare By Her Caterpillars, Even. Thanks Duchamp! Amazing to think that these resulting butterflies, hatched in my yard, will fly to Mexico!